We are so scared in Europe by financial crisis and economic challenges while the major deadly threat seems to have come into sort of shade. Stay aware. Terrorism is alive. Not only the French Toulouse but American tragedy 2001 may well happen in any European country one day. And I want to be fully aware of the threat, which is real!! I don't want to stay sleepy and listening to such a tale I've recently heard from our precious police reps. They detained some Al-Qaida terrorist in Valencia, who had been recruiting young men there to send'em somewhere, some far away regions. To hell with those lies! This is Spain where AlQaida is working, here and now! Here and now! Camp Nou in Barcelona and Santiago Bernabeu in Madrid were targets in his list!! Those were to be huge blasts and thousands of dead and injured! Couple of friendly geeks.... excellent at hacking .... have informed me. Actually I'd rather expected this sort of the thing from the cops!! thanks for the info. the news refers to propaganda and maybe recruiting. if your foreshadowing an sensational action. please justify. WElcome to the BV by the way, what part of Europe are you from to have such economic worries and why? This is Spain where AlQaida is working, here and now ? 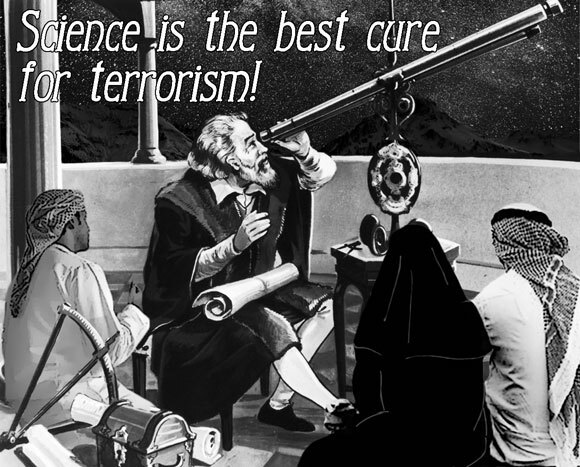 Referring to the picture above..
Well since we owe so much of modern science to the mathematicians, physicists and planetary observers from the Eastern countries, I would suggest the chap looking through the telescope is the student, while around him are the learned men and women with their interpreters, teaching him the secrets of science. And look how that is working out. Oh. And the op may be scared, but I doubt the rest of Europe would agree. It seems we have a poster or two (Probably one) that know the truth about our so-called ally, Turkey. Nato's only Muslim member. The picture of Erdogan with oily hands is a reference to his 'alleged' co-operation with, and continued funding to, Daesh, or ISIS, or whatever this month's catchy name is. I think it important to note that Daesh are not your 'typical' Muslims. They have killed well over 100,000 Muslims in Iraq and Syria so far, and will account for many more yet. America will soon have official 'boots on the ground' again in Iraq and Syria. No-one ever won a conventional war from the air yet, and Daesh are almost completely undistinguishable from their civilian captives from the air. They have tunnelled under most streets and houses in the towns they have captured and will need winkling out one at a time, hand-to-hand. The ever-hungry war-machine of the United States needs those resources and as we all know, is not shy about spending its own blood and treasure to get them.Because of that, you Americans now find yourselves aligned with such esteemed company on the human-rights front. Your new best pals, The Kingdom of Saudi Arabia, a real Kingdom with a real 7th century feudal kingship. Apart from regularly chopping peoples heads off with not-all-that-sharp swords, NOT being a Muslim will get you jail-time, a flogging, or a one-way trip to the chop-choppy man. In fact, Christian Bibles are not only banned, mere possession of one will get you the same one-way trip to Mister Wavy-Sword because it is against the law for non-Muslims to worship in public in Saudi Arabia and there are no houses of worship to cater to non-Muslims. Although, that said, Saudi Arabia is applying one of several interpretations of Islamic Law. Which, by the way, are almost identical to the Fundamental Christian interpretations of God's laws. After all, since Islam is one of the Abrahamic religions along with Judaism and Christianity, they are all based on the same ideals. Are we not known by the friends we keep?